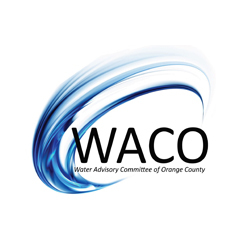 The Water Advisory Committee of Orange County (WACO) was formed in 1983 to facilitate the introduction, discussion, and debate of current and emerging water issues among Orange County policymakers and water professionals. It has also advocated the Orange County water community’s position on issues affecting the provision and management of our water supplies, with lawmakers, regulatory agencies, regional and state water organizations, and others. The committee’s membership has evolved during the past quarter century to include not only the elected officials and management staff from many Orange County water districts and cities, but also engineers, attorneys, consultants, and other professionals who work with the Orange County water community, as well as residents and community group members who share a common interest in water issues. Monthly meetings are open to the public and are typically held on the first Friday of each month at 7:30 a.m. at the Fountain Valley headquarters of the Municipal Water District of Orange County and Orange County Water District. The meetings provide attendees with an opportunity for professional networking and to receive informative presentations from water industry professionals, academics, economists, engineers, political officials, and others about key water issues affecting Orange County. Visit our YouTube channel to view past presentations.